Horror movie buffs know it. The success of a horror villain almost always comes down to their weapon of choice. When the final reveal scene comes and we get to see the villain in the flesh, you never see them wielding a mop or a pineapple. No! They must have a weapon that strikes fear into the hearts of their victims and nothing is quite as frightening as the menacing chainsaw! Of course, it’s not exactly a great idea to waltz around on Halloween night swinging around a real chainsaw. Not only is that dangerous, but you might have a hard time explaining it to your friends and family. 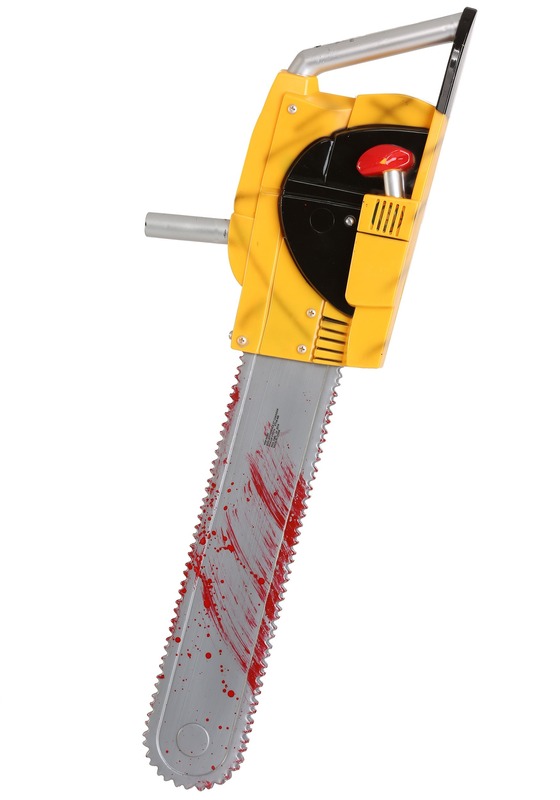 Instead, why don’t you bring this toy chainsaw with you? It’s much safer and it’s also much scarier. This chainsaw accessory measures a full 27 inches long and is designed to look like the weapon of a real horror movie villain. Just press the button on the handle to hear the realistic chainsaw noises. The blade even has fake blood on it to help scare your friends and family. Just pair this menacing accessory with any of our scary costumes and you’re sure to spread terror across the neighborhood. You’ll look like a real horror movie villain.